ELECT Paula Colbath, Michael Osso, & Ammad Quaraishi for Fort Lee BOE PLEASE VOTE FOR Paula Colbath, Michael Osso & Ammad Quaraishi for Fort Lee Board of Education. Please Protect our Children! Tomorrow is Election Day 2014. The Fort Lee Board of Education is in crisis as is the case every year. If this year is to be different, everyone has to vote and make his/her vote count. There are now four (4) candidates for three (3) seats in the election. However, one of them, Paula Colbath is a write-in candidate. That means that when you vote for her, you may have to work a little harder, but it is well worth the time. If you go to the bottom in the voting booth, you can type in a write-in candidate. Paula Colbath has been a stalwart supporter of Fort Lee children for many years, attending Board of Education meetings on a regular basis. She is an attorney with strong credentials and is extremely well spoken. Paula has a big heart, contributing to fundraisers for the children and advocating for their well-being. Most importantly, Paula supports improving the quality of education in Fort Lee. Michael Osso and Ammad Quaraishi are running and should be supported also. Michael is a dedicated family man, a coach, and has children in the system. Ammad is an extremely bright young man who has been through the Fort Lee school system and understands how critical it is to improve the standards in our community. He believes that it is essential to keep our schools competitive with the best high schools in the state. Finally, there is Joseph Surace, who in my humble opinion, has been a blight on the Fort Lee educational environment for years. 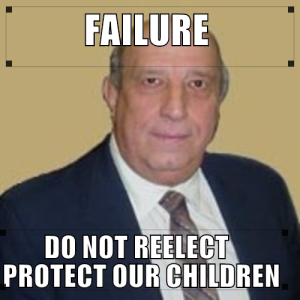 Voting to reelect Mr. Surace to the BOE is an insult to our children. His ethics have been questioned for years. Mr. Surace consistently abuses privilege and defies anyone to stand up to him. Go to the website www.flboe.com, click on Board of Education, members and meetings, and finally click on the meeting 6/30/2014. Fast forward to 2:45 at that meeting and pay close regard to Mr. Surace’s behavior. Embarrassing and classless would just begin to describe his actions. 2014 is Fort Lee’s opportunity to make the Board of Election relevant by electing new candidates that care about our children. It is an opportunity to rid the Board of a dinosaur that runs for the BOE election after election for his own reasons. His actions clearly show that he is not there for the betterment of our educational system and our children. Please take the time to vote this year. Write-in Paula Colbath and support Michael Osso and Ammad Quaraishi. We need to move forward for the sake of our children and the Fort Lee Community.